In this episode Ross Stewart catches up with Dan Mitchell, of Dan Mitchell Fitness. Dan’s contributed pretty extensively to the Shredded By Science Academy & within Lift The Bar’s group. He’s a top bloke with a helluva lot to offer the industry when it comes to changing bodies. 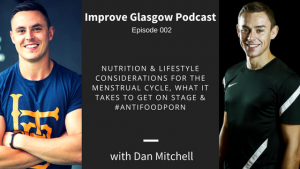 He’s also (perhaps a little weirdly…only joking, Dan) very knowledgable in the area of nutrition when it comes to female’s menstrual cycles, which is an area we see a lot of females struggling in. Big thanks to Dan for giving up his Tuesday night to blether to us.